Aoife Carrigy reports on several players in the Irish whiskey renaissance who are forging their own niche in a booming sector. So said Lorcan Rossi, CEO of the Dublin Whiskey Distillery Company, which is resurrecting the once-iconic D.W.D brand. Though named after an historic distillery, the company is in no hurry to build its own. As Rossi explains, “we feel it is wise to wait and consider the Irish distilling landscape as it evolves over the next few years before finalising our plans to build our own distillery…” For now, they have secured long-term access to aged Irish whiskey stocks and are pitching themselves as “a new independent Irish whiskey blender and bottler”. Louise McGuane of Chapel Gate Irish Whiskey Company (pictured above) is going one step further. “I’m never going to have a distillery,” she claims proudly. Instead, Louise is on a mission to bring back the lost art of Irish whiskey bonding. The original D.W.D. closed in 1946 but the brand is now being revived. During the 19th-century “golden age” of Irish whiskey, distilleries – of which there were hundreds – would sell directly to whiskey bonders who would source, barrel age, blend, bottle and sell the whiskey under their own independent brands. The resulting regional variation, Louise argues, was lost when the industry consolidated under a few main brands. Many bonders were small-scale grocers or publicans, like a certain JJ Corry who was born near the McGuane family farm in west Clare and went on to operate a whiskey bonders in nearby Kilrush from the 1890s. Inspired by JJ’s story and the rich heritage of this once-widespread business model, Louise abandoned her original plans – “to have a grain-to-glass operation with a distillery on the farm” – and established herself as a modern-day whiskey bonder. In one sense, what D.W.D and Chapel Gate are doing is common practice today. Given the ageing requirements for Irish whiskey – at least three years and a day, legally – most new distilleries trade whiskey that they have acquired, blended and bottled long before they have any of their own to release. The difference lies in making a virtue of the practice and building your business model around it. “My core goal,” Louise says, “is to have a library of whiskey from all over Ireland and to blend that to create our own unique house style.” Key to that style is the maturation process. This takes place in Chapel Gate’s bonded rack house, which has been purpose-built on the family farm to make best use of west Clare’s briny air and mercurial weather. Those wild fluctuations of atmospheric pressure, temperature and humidity are ideal conditions for barrel ageing, as are the south-facing aspect and the gravel-strewn earthen floor. Bonding underway at Chapel Gate. 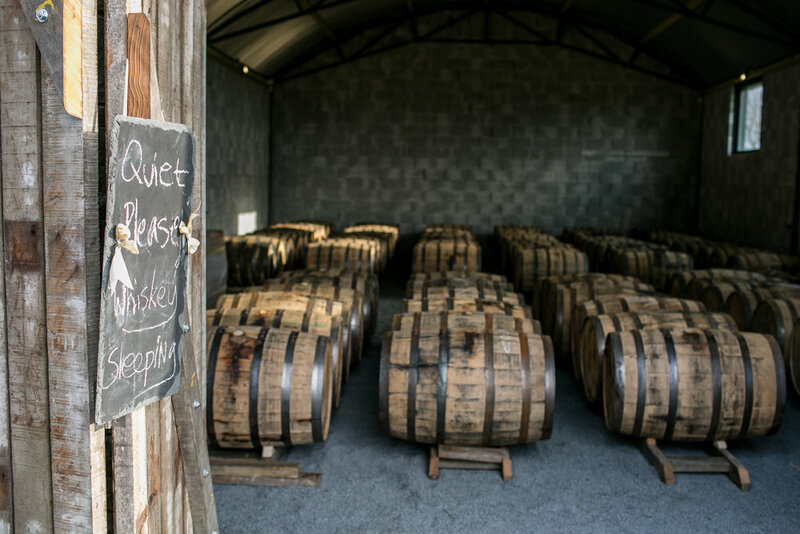 Louise buys casks directly from hand-picked bourbon distilleries, sherry bodegas or Bordeaux wineries. Once filled with the finest whiskey she can source – such as the mature ex-Cooley stock in her first JJ Corry release – casks are stored “on the bilge” (horizontally), a once-traditional if costly practice that Louise is punting will give richer results. With so much emphasis on ageing, the expert maintenance of those all-important barrels is crucial and is carried out by one of Ireland’s last master coopers. John Neilly has been brought out of retirement by the far-sighted folk at Nephin Distillery. He is training two brothers, the first of a new generation of coopers who will provide essential services for independent distilleries.